The Morones and Estrada families have been closely tied together for generations. Like many Latino families whose histories evolved and can be traced back to roots in Mexico both families share a very similar story on how they arrived in this country. Once here these two proud families both contributed to the growth of this country with many family members serving in the armed services protecting this country. The last reunion was held many years ago in the Mission town of San Miguel near Paso Robles California. 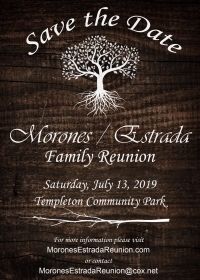 Morones and Estrada family members are planning an exciting weekend of events that will allow family to reacquaint and interact with family they perhaps have not seen in quite some time. Most importantly this reunion weekend will also celebrate and remember our past family members while at the same time giving our younger family members the opportunity to learn about their past family history. We also recommend you reserve your accommodations as soon as possible. Paso Robles is a small town. Go to the "Travelers" tab for more information on Hotels and RV Parks availability. Please make sure to buy your tickets and RSVP for the Reunion events on this site as soon as possible.